Been busy tonight. Still need to add tabs back in where I corrected geometry, but the stripes and windows are from the Disney magazine model as are the wheels. The geometry came from a model that Tektonten said was the best bug he'd built. Had to do my own bumpers. Also had to darken the wheel wells, fix the lights and hardware, etc. etc. Couldn't resist and started cutting. Found something that needs tweaked already. I'll do a work-around on my build, but I have already fixed the file. The back end should have been 2/3 of a bumper longer. The importance of test builds. Man you are becoming the car king! Is that one of AirDaves or are you creating your own now? 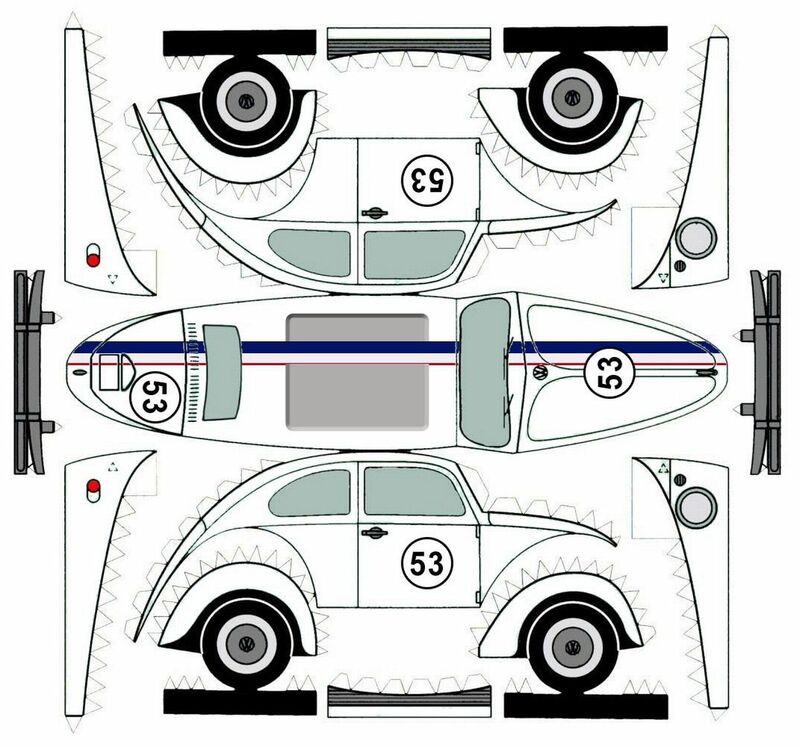 Dean Jones's birthday was the other day, so I was looking at the different Herbie models out there and wasn't satisfied with any of them. Wrong wheels, wrong bumpers, no sunroof, wrong hardware, etc., etc. I figured I might as well do an alpha build of my repaint rather than the model mentioned by Tektonten. So, I'm learning about how the designer of that model was doing things, which isn't bad, but it always seems odd when you have to partially glue down a part before installing other parts, then finish gluing down the first part. That's the way the base plate is. You have to attach it to the running boards to get the body width correct before gluing the axles, then attach the base ends. I wouldn't worry about half glued piece in the assembly process. Whatever works! I have not seen a lot of nice beatle models and that one looks very promising. Keep up the great work! When I get this worked out, I plan on doing a couple other paint jobs. There aren't very many parts. If I break the base up into three segments (which will also allow more stable geometry of the front and back) I think it is going to be 20 pieces. The original must have been done by a German-speaker. If you look at the template images, you will see the word 'Auspuff' where the exhaust goes. I'm not looking forward to the exhaust. One piece with three tubes ... and no solid place to glue it. By breaking the base into three parts, the front and back will be structural and give a solid point to glue the exhaust, which may get re-designed. This includes an adjustment to the tires. It was such an odd way to do them, with no way to know where to glue the tread ends together. By comparing other wheel assemblies from other models, there is now a tab at the end of one end of each tread to mark the amount of overlap required. Very interesting, i didnt know that if i want to make a paper car model i had to made like this. i mean, i was thinking is more like build something from scratch...but i see that geometry is important here. How do you know if everything is going to fix in the end¿? there is a logic or just try and try? beatiful work Verming king,thanks for sharing! Experience building models and doing some design work lets me see glaring errors and places that may not be best. When it comes to models, you will never fix everything. Every model will have some errors in it. The goal is to get a model with minimal errors that a slightly below-average builder will have an acceptable model when finished. Some designers create 'Builders Models'. Those are for above-average builders who want extra detail and want to have correct curve to the panels, and know how to handle extra seams. That's not what is needed here. My goal for this is to make a reasonably easy build that when you sit the model on the shelf, people that see it will know what it is and be delighted that it is made of paper. It actually had the cloth sunroof, but the stripes are messed up, the wheels are wrong, it has VW logos (which Volkswagen wouldn't allow in the first movie), the bumpers are wrong, the running boards have too much curve, side windows don't have the 'vent window', etc. When I finish this model, I might do a repaint of this second one to make it a little more correct. It would probably be more like what would be needed in this community. This rendition of Herbie looks great to me and I wouldn't be surprised if I see it in one of okumarts battle reports soon! One thing I've been doing instead of making wheels out of paper is using black foamcore and pasting the wheel bit on it. I'm lazy. Funny you should mention wheels. That's where I stalled on the actual build. Cut out and figured out the issue of how much overlap is required. And then I got distracted. Locally available black foamcore is black paper on white foam. I keep seeing more and more issues with the simple version, and it brings up a good point on mine ... no front trunk release handle. I cut out a wheel front as best I can with scissors, go down to the dollar store, and buy a toy car with wheels close to the appropriate size. Usually. Sometimes the wheels are just a part of the side of the model, and I just leave it there. Here's the more difficult one finished. I have to re-think the attachment points. Also, the rear window is too high. Vermin King, do you know if that is a specific scale? It seems 1/32 to me. Ah, I was using 94.5" as a total length, not axle-to-axle. My bad! I am always building new police stuff for Pinkfluffdoodle IV... usually wheeled. This would fit right in! thanks for the reply before Verming king! Glad to stay in this forum, to much inspirational!